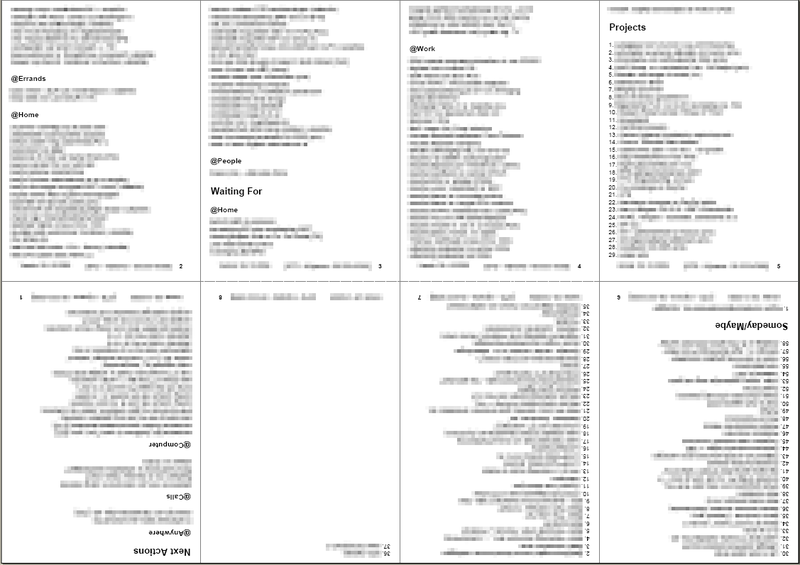 Update Oct 28, 2007: Check out my Free Stuff page for a free, “as is” version of my GTD System for Excel. Use at your own risk. Read all warning and usage texts in the Excel sheet itself. You have been warned! NO SUPPORT for this version. Updates and more stable, commercial versions may follow. Feedback is appreciated. Update Mar 18, 2007: This article describes my current GTD system in words and pictures. At this moment there is no downloadable Excel sheet! If this changes, my blog readers will be the first to know. See the comments section of this post for further discussion. It is perfectly possible to implement GTD in Excel. In fact, I think Excel is a perfect tool for many purposes. Using a combination of built-in Excel formulas and my own custom made VBA code, I have implemented a basic GTD system for myself. It is in fact an ongoing project, but I am using the system successfully every day. working the way I want it to! I have been playing around with quite a few GTD tools, but none of them has satisfied all of these requirements. My own GTD system satisfies all my requirements and more. The most important property of any tool is that is easy and fun to use, otherwise the tool will not be used properly and certainly not regularly. Instead of conforming my ideas to other GTD tools, I have created my own GTD tool that conforms to my own ideas. So what does it actually look like? First, let me show you the overview and data entry screen, the “dashboard” screen if you will. Please note that I have taken the liberty of blurring certain parts of the following screenshots to protect my own privacy . The dashboard is used to get a quick overview of how many actions and projects are active or finished. It also shows the oldest and newest 5 actions (this doesn’t work properly yet and I am starting to doubt the usefulness of this information anyway). One thing to bear in mind is that all the information on the dashboard is generated automatically and dynamically from the other sheets. The righthand side of the screen is used for data entry. Actions, projects, someday/maybe’s and other data are entered here. Some more details about adding a new action: you simply type a description of the action, optionally select a project from the list, optionally select a context from the list and optionally enter a due date for this action. If the action is actually a “waiting for” action then check the appropriate checkbox. Finally, click on the Add button to actually add a new action. 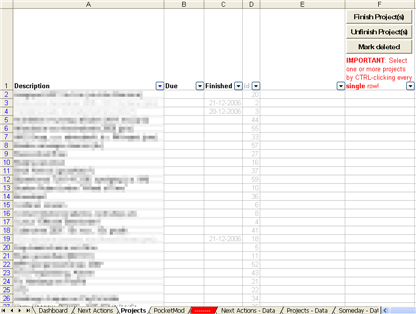 Actually, with some Excel magic, I have been able to construct dynamic pull-down lists for projects and contexts. No manual editing or maintenance required whatsoever! Note how finished next actions (tasks, if you will) are automatically greyed out and waiting for actions are automatically highlighted. Actions can be manipulated directly on this sheet by using the 3 buttons in the upper-right corner of the screen: Finish Action(s), Unfinish Action(s) and Mark deleted. Just select any number of actions and click one of the buttons to perform the corresponding operation. 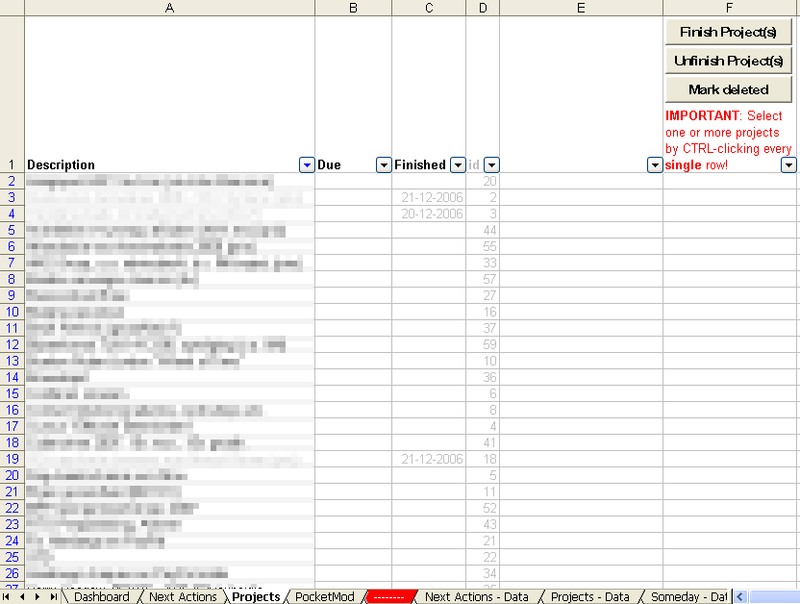 Just like the list of next actions, the list of projects can be filtered and sorted by using standard Excel tools. Projects can be (un)finished or marked deleted similarly to next actions by selecting one or more projects from the list and clicking the appropriate button. Finished projects are automatically greyed out. 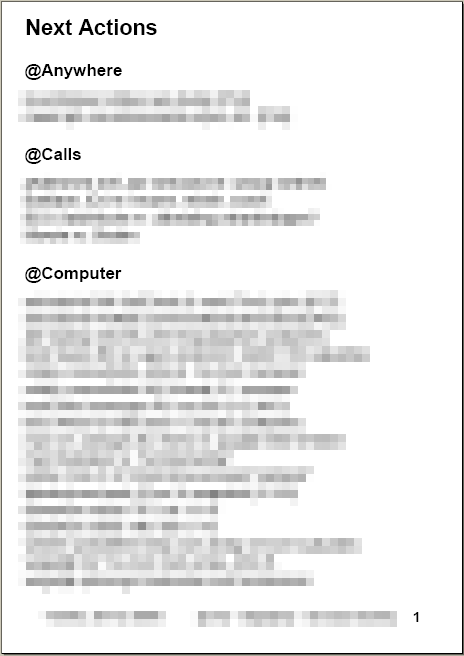 Perhaps the most important requirement that I put on any GTD system (which, perhaps, is why many of them are not suitable for me) is the ability to flawlessly sync the next actions, projects, et cetera to paper. My offline GTD system consists mainly of a pen and one or more (usually two) PocketMods. 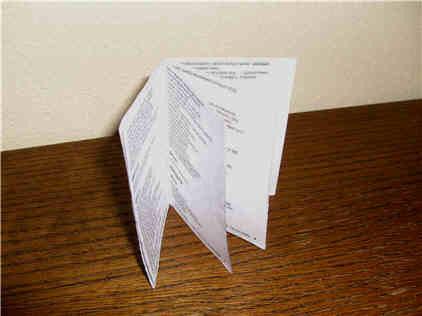 If you are unfamiliar with a PocketMod, I suggest you visit www.pocketmod.com to find out how wonderfully ingenious one single sheet of paper can be . The final sheet I want to show you from my Excel GTD system formats the underlying data (next actions, waiting for, projects, someday/maybe’s) into one giant list by executing some custom made VBA code. It can even add manual pagebreaks if needed. Note how some next actions are automatically labeled with project numbers. This makes it easier to find the corresponding project in the numbered list in my pocketmod. Next actions are sorted and grouped (by context). Projects and someday/maybe’s are numbered for easy reference. 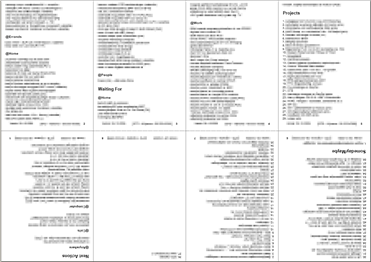 Each page contains a footer with the current page number, my name and telephone number and the creation date. 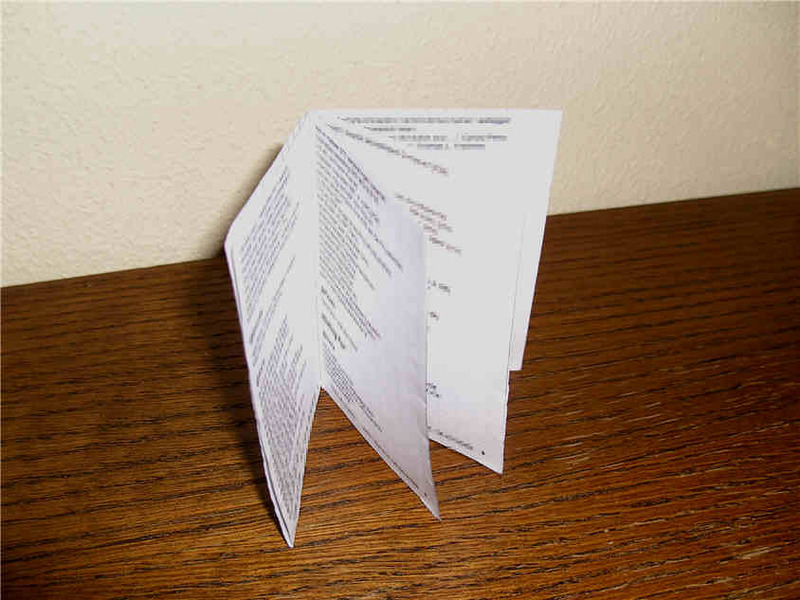 Printing and folding this single sheet of paper will actually allow you to carry an up-to-date, simple to use, lightweight, paper-based GTD system with you in your pocket! I have used everything from laptop to PDA, from paper notebook to index cards (hipster PDA! ), but nothing -in my humble opinion- compares to the simplicity, portability and flexibility of a pen/pencil and a pocketmod! To me, Excel has proved to be a valuable tool for implementing a GTD system that is actually easy and fun to use, does exactly what I want it to do (since I created it! ) 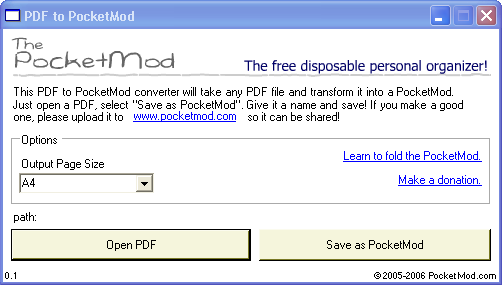 and allows flexible syncing to paper (pocketmod). In other words, I have created an environment that is perfectly suited to my (GTD) needs, therefore making it easier to use and keep using Getting Things Done to successfully organize my personal and professional life! Do you think you can share your xls file w/ your readers someday? If/when I feel that the Excel GTD file is suitable for releasing to the public in the future, I will certainly consider sharing it with other GTD fans. At the moment I feel it is only usable by me and still needs a lot of work to make it suitable for a general user. Nice. Very nice. I love Excel, but I have a lot to learn especially on the VBA front. This looks really good. Well done. It only uses a small amount of VBA, the rest is built upon standard Excel formulas, though some are a bit complex. My dream would be to make a grand unified spreadsheet that works in Excel, Google Spreadsheets and OpenOffice to name a few. Why not share it and let people wrestle with it if they like to? You might even get some better working version back by this. [quote comment="19"]Why not share it and let people wrestle with it if they like to? This seems to be a great idea. Could you share this with others. It would rather be easy to debug and make it better. I for one would love to test your system asap. Just another plea for sharing this: like most of us who get interested in GTD, I’m still shopping around for the perfect system, and this one looks very tempting to me, but I don’t have the skills to set it up. Anytime you think it’s ready, I’d love to know! Thanks, and thanks for sharing these ideas. Thanks for your interest in my GTD system and ideas. If I am ever going to release a decent version of the Excel GTD system to the general public, it is definitely going to be announced on this GTD blog. I would also love to see your XLS template, if you’re ever willing to share! I have just started using Hiveminder (hiveminder.com) and am really liking it so far (I notice it’s not on your Ultimate Index, which is why I mention it). The tagging feature allows a lot of flexible sorting like you describe here. It also walks you through a review activity for any list you’re viewing, which I used today for my weekly review. It does have a couple things that could be improved to be more GTD-friendly, but it’s also under very active development, so I am suggesting these as I go along. Thank you for your interest in my Excel GTD system! As for hiveminder.com, I took a quick peek at the website but I admit I didn’t try the online application. It looks like another online task management system. I am trying to keep the GTD Index strictly GTD related and I’m therefore hesitant to add any kind of general task manager unless they explicitly support the GTD methodology. Let me know if my first impression is wrong about hiveminder.com and I will reconsider adding it to the GTD Index. Truly outstanding concept of putting GTD and Excel together. We the people of the web will wait for this innovation to hit us before Opening day this April. Could you point out the right links that will help us create Excel VBA code, Dynamic lists, etc, so that we can also learn this stuff. There are countless sites dedicated to Excel. Hi, Great article. Well written, well reasoned, illustrated with pictures. AND NO EXCEL FILE TO USE. That’s like a band showing photos of their concerts, rehearsal space, the console they used to record the tracks and then NO AUDIO FILES TO LISTEN TO. This article is empty calories. The point was to show my GTD setup as I currently use it and to inspire other GTD enthusiasts. If I show pictures of my other GTD tools, like my diary, or my inbox, or my tickler, do you also expect that you can get these tools from me? If I make something or show something, it doesn’t automatically mean it should be shared and/or instantly available, does it?? On the other hand, I do appreciate all the positive feedback I am getting about using Excel for GTD. I refer to all the comments above about when, how or why the Excel file will ever be available for download. Let me start by saying that I do appreciate your screenshots of your Excel implementation of GTD. I think what you are hearing is that people would really want to get this and try it out for themselves. A lot of people use Excel, but most don’t really use it to it’s full extent and I believe it’s far superior to Online implementations of GTD that I’ve seen due to many things you’ve outlined. My top two have been 1) Security (I want full control over my file and I password lock it during save and need to enter a Password to unlock it each and every morning I open it 2) It needed to be a single file for portability and archival 3) It needed to be quick to deal with Actions. Now comes the part when I think I’ll do a little analysis here. It sounds to me you are getting yourself “wrapped around the axle” about perfectionism rather than keeping in the spirit of sharing even if it’s not done. There has to be .1 or 1.0 release, someday right? I’ll be blunt and say that I believe you put a considerable amount of work into this and you either a)Don’t feel it’s perfect or b)Don’t feel like sharing because it was hard work (why give something hard earned away for free?). I’ll be very open by saying that I believe it’s mostly the latter by your comments but I could be wrong since you are indeed sharing by showing us what it looks like. I guess what I’m saying is that people won’t really know until they tried it out. It’s like testing any online app for GTD. It will excel (no pun intended) in one criteria and fail at another. I also use Excel to track all my Next Actions, but also for a team of Engineers since I’m a manager and I’ve found it extremely useful. What I found most useful in your implementation that differs from mine is that you have id numbers to identify each task. Other than that I don’t see great merit in having an “add project” or similar functionality since one can just add this to a single worksheet in one line (which you also have BTW) It’s just that the Dashboard view is less helpful I believe. I find it much faster to view all my Next actions this way and I simply perform a Data/Filter/Autofilter to sort by Project, etc. I’m following a K.I.S.S. principle for this and it also lends itself quite nicely for cut/paste into an email when I’m delegating to my employees “Next Actions/Tasks” on thier plate. It’s also less time consuming to figure it out if I had to explain it to someone. Another addition I’ve done is Conditional Formatting for the columns and to calculate the “Days until Due”. For example, if it’s getting close (under 3 days) until a due date, the color of a cell will change color from a nice Blue towards Red. If it’s past due it’s obviously Red and will continue to show the days. BTW, I’m very anxious to fully move into Excel 2007 which I’ve enjoyed and also formatting and bar/color graphs within cells. I appreciate your candid approach and I agree with you that it is a combination of at least 2 things that you have mentioned in your comment (actually, there are other private reasons which are… well… private ). Shortly after discovering GTD and having tried a million different digital GTD solutions (and not liking a single one of them), I invested a couple of weeks of my time to create a very preliminary, very unfinished but highly customized Excel sheet for implementing GTD. The thought of sharing this Excel sheet didn’t arise until after reading all the comments on my blog. Honestly, I was surprised by the overwhelming interest in my Excel GTD system! I haven’t even had time in months to develop the Excel GTD system further. I just use it “as is”, which means you need some understanding of Excel and VBA to use it correctly. I feel reluctant to release something that might look great in the screenshots but is basically very unstable and requires a great deal of “inside” knowledge. I also feel reluctant to release something in a hurry right now without having a chance to think about future development and other future plans I may have with this Excel system or even variations of my own online or offline GTD system (I am a former (web) programmer after all). All options are open at this point. There is even the possibility of releasing a free public version of the Excel system but with no support from me, and perhaps an advanced, commercial version with product support and documentation, and so on. My main point is that I didn’t even have time to think about these possibilities properly, and I am not going to let myself be forced to release something that I do not agree with and cannot support. However, this is all speculation because I have so many other things on my projects and someday/maybe lists. The readers of my blog will be the first to know about my future plans with my Excel GTD system! You sir, are a stand up guy and I also appreciate your response. Whatever happens next please know that you DO help others with ideas on how they can possibly implement GTD in their own lives. If anything you have definitely sparked an interest in Excel as a tool and bottom line, that is enough in my book. Personally I’m still on a quest to find that elusive set of tools that will help manage the daily flow of information. My system will likely continue to be a hybrid of paper and electronic. I have yet to see a set of tools that exist that can satisfy my thirst for the “best of breed” because I believe everyone out there has their own taste and I’m no different. Some will try Paper only, and some will be looking at web-based systems, etc. Right now I’m trying out everything and settling on tools that seem to resonate with me personally. Maybe in a year or two the dust will settle on a couple of tools. Then again maybe a new tool will come out and rock my world. Here’s to everyone out there as they journey toward the best tools possible. Just don’t forget to “get things done” in-between fiddling with them. great post .. now i also use excel to maintain gtd database. I dont know much about about vba, so i put everything in one single sheet & playing with some excel data features. Great stuff, no wonder there is a big interest to try it out. I agree with you to take your time to think first and do the right thing second . No hurry, people will want it in few months as well as they do now, maybe more . I’m in the same process of trying out many different GTD systems. I’m more of “electronic way” guy so playing with papers didn’t sound right for me but after reading your article, I’m starting to change my attitude as I see it’s so easy to use. Thanks for your compliment! And good luck reading everything I have written so far! I think you are in the phase many of us are going through one or more times, that is, trying different GTD systems, or tweaking your “ultimate” GTD system until it feels just right. 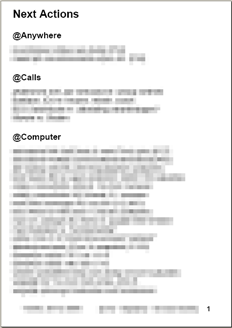 I have managed to stay with my hybrid GTD system for several months now, implementing minor tweaks only. Have just started GTD and am currently using totally paper based system which can be awkward. Would love to be able to use something like this. To keep things to the point, like it, want it. Well done. Count me in for wanting go use your spreadsheet as a template! I just can’t wrap my head around the set-up, but I’m sure would find it incredibly useful! If you post your excel file, I’ll be watching to download it! Thx. Are there any news when the spreadsheet will be available for download? Very nice post, and this deserves a link on my blog. If you ever share your Excel document, I would be really pleased! I’ve been watching this page for 7 months now and am still patiently awaiting a chance to take a look at the actual spreadsheet. If it’s money issue I’m sure that there are a number of us that would be willing to kick you some dough for even a “not ready for public consumption” product. I like to tinker with programs, spreadsheets, databases, ect and tweak them where I can and I’d love to crack into this one. Please consider letting us take a look at what looks like a wonderful tool! Why isn’t this available to download yet? or could you at least post images of the back-end tabs? I’ve stopped using my Excel sheet for GTD about 3 months ago as I’m using a PDA with ListPro as the core of my GTD system at the moment. Many thanks for your promise to release the excel sheet as a “free as-is” version. I am in the look-out for a new system. It would be really helpful, if you could release the sheet asap. I am sure there are a lot of people will to try it immediately. Well done! I would like to get a copy in my e-mail, if you don’t mind. Keep up the good work! Sure, I will send you a copy in a day! Just send me a email to ping me!! I hope you have got time to brush your excel sheet. Please post the download link of it. Thanks for the kind reminder. I still stand by my promise, but other activities claim my time. I’ll post more info (and hopefully including a download link) whenever I’ve had some time to continue working on a presentable “free” version of my Excel GTD sheet! This is not going to take months, I promise! I think I can use this. Great site. Glad I found. Would love to see the real .xls file. Has it been a few weeks? Time for a kind reminder. Thanks! Looking forward to seeing your great excel downloadable file soon. Can you let us know whether you intend to publish this? I see that people have been asking since January and would be great if you can confirm this, one way or another. Seems like the answer for me, I need a GTD system I can use on work machines, without breaking rules on installing new software, I would love to use this. It’s a pity, you don’t share it. It would interesting to submit it to the community for feedbacks, customization and improvement. “Getting things done” in a intelligent way: we are more smarter together than alone. I’ll download it have a go at it. Have you tried Thinking Rock? Thanks….now I get a chance to kick the tires! Could you send me a copy of your GTD system for Excel. Frankly sir, your a pin head. What would it hurt to share a strip down version to get people started. I read your “rationalization” but the bottom line is you don’t like to share. You’d rather “show off” how smart you are. I got you number, you’re a pin head. ooops i found it I apologize. Hey! Your excel spreadsheet looks great, though it is not working on my PC. Could you kindly re-load it? Many thanks! Awesome sheet. Finally I have a tool that is worth using. Thanks so much! 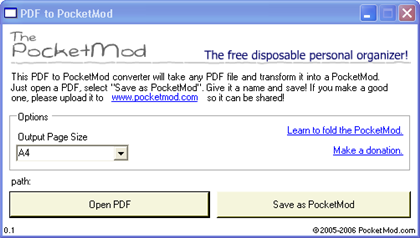 PS – Any chance on having the PocketMod function built back in?